It happened to the Waugh brothers and now it looks like the same fate will befall the Morkels: one sibling making way for the other to make his Test debut. 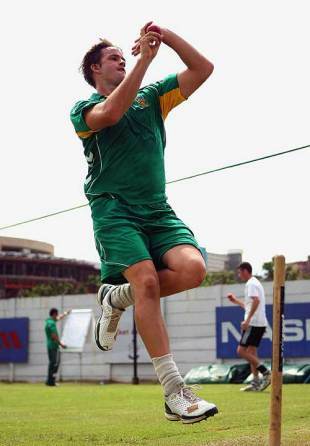 Albie Morkel is an almost certain starter for Thursday's third Test in Cape Town after his brother Morne was axed and the South Africans would love it if he burst onto the Test scene as successfully as Mark Waugh, who made a century on debut when he was given a game at the expense of his brother Steve. The coach Mickey Arthur is the man who generally picks South Africa's starting XI from the squad he has been given, and he said on Tuesday that Morkel was set to get the nod ahead of the other uncapped fast bowler, Wayne Parnell. But after Arthur and the convenor of selectors Mike Procter clashed on the JP Duminy-Ashwell Prince selection issue last month, the coach was hesitant to give any firm guarantees. "I've got to discuss that with Proccy [Procter] first but I do think that in all likelihood Albie will start," Arthur said. "It gives us a bit more batting depth, but we have to get 20 wickets. His pace in Australia was decent. He seems to be getting his pace up and he's found that nip again. But what he's also done is he's bowled the length that we haven't been able to do against the Australians. "We've been a little bit too short, we've been a little bit too full. We haven't been able to hit that in-between length. Albie possesses that ability and can swing the ball back into the left-hander, one of the areas we identified against both [Marcus] North and [Phillip] Hughes and haven't been able to exploit." While there will be one change to South Africa's attack, there will be at least two alterations to their top order with Ashwell Prince and Imraan Khan surprisingly chosen to open as replacements for the injured Graeme Smith and the demoted Neil McKenzie. It's a scenario that has divided South African cricket circles as Prince is a specialist No. 5 and Khan, though currently in form, has until this season struggled to make his name at domestic level. One of the major talking points has been the insistence of Procter and Arthur that the men in the No. 3 to No. 6 positions - Hashim Amla, Jacques Kallis, AB de Villiers and JP Duminy - remain firmly in their familiar roles rather than being promoted to open. Arthur said it was always his preference to choose the country's six best batsmen and worry about the order later. "They weren't consulted, I don't think it's their decision," Arthur said when asked why none of the established middle-order men had volunteered to open. "I think three, four, five and six have been very successful. The opportunity to arise is at the top of the order. I'm very conscious of having our six best players ... batting, irrespective of what the order is going to be. One to six we can sort out later." But while the South Africans are running out of time to rediscover their cohesion, the Australians are wary of the wounded hosts. Michael Hussey said it would be a mistake to assume that a seemingly confused South Africa would equate to a weak South Africa. "I think back to when we played against India in Australia," Hussey said. "In Sydney there were similar sort of talk. We were two-nil up in the series, there was a lot of controversy going around and it sort of pulled their team together a bit tighter. We'll do our strong preparation on their new players coming in and make sure we have good plans against them ... but we can't really afford to take our eye off us and focus too much on their camp." Australia have their own selection issues to contend with in the next 24 hours. The Newlands pitch is sporting some bare patches at both ends and will certainly provide assistance for spinners, so the uncapped legspinner Bryce McGain is likely to feature heavily in discussions before the team is confirmed on Wednesday afternoon.